“The 5.6 billion is such a small amount and we are talking about national security,” Trump added, saying: “I think the people of this country think I am right.”!! 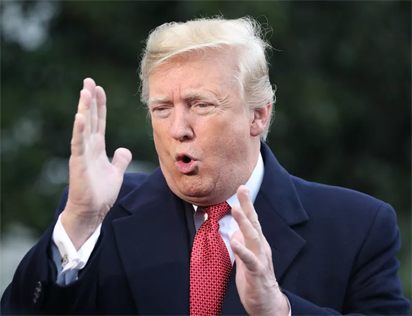 US President Donald Trump warned that the partial shutdown of the US government, which entered its 12th day on Wednesday, could last a “long time” as he stood firm in his demand for billions of dollars in funding for a border wall with Mexico. One day before Democrats take over control of the House of Representatives, Trump showed no signs of backing away from his insistence on $5.6 billion for his “beautiful” southern wall. “I think the people of this country think I am right,” Trump said, and it “could be a long time” before the government reopens. Trump is set to hold talks with top Democratic lawmakers Nancy Pelosi and Chuck Schumer in a bid to break the impasse. It will be Trump’s first meeting with Pelosi, who will take over as speaker of the House on Thursday, and Schumer, the Senate minority leader, since an acrimonious Oval Office meeting with the pair on December 11. Democrats say the border wall, one of Trump’s key campaign promises, is a distraction from more complicated immigration problems and a tool for Trump to whip up support among his conservative base. The standoff resulted in swaths of the federal government being shut down over the Christmas and New Year holidays — and for the foreseeable future until a deal is reached. – Romney hits out at Trump – Amid the stalemate over the wall, Trump shelved his annual Christmas vacation in Florida, choosing to remain in Washington and fire off a stream of angry — and often misleading — tweets.